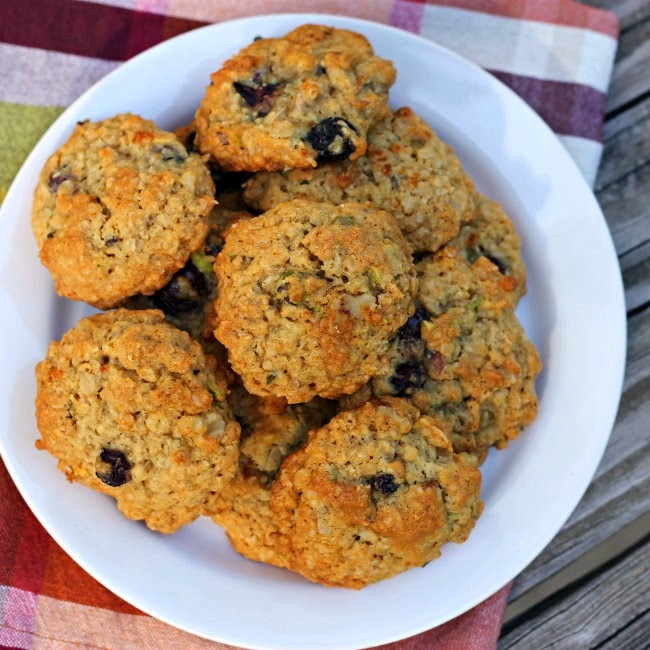 These cookies are perfect for breakfast on the go… yeah, cookies for breakfast! First of all I want to wish all of you from the USA a Happy 4th of July. I hope you had a wonderful holiday. It was nice to have the day off from work. Although we did not do anything exciting, we did some work around the house and got a lot of things done. With the summer in full swing one of the things I like most about these months are the fresh berries. Blueberries are one of my all-time favorites when it comes to berries. I love baked items with blueberries, but when I thought about it I had never baked cookies with blueberries before. That really got me thinking that blueberries would be perfect for a cookie for breakfast. Yeah, breakfast cookies; I have been seeing recipes on and around the web for these things. I am not sure what the difference is between the breakfast cookies and regular cookies, but I think that maybe breakfast cookies are a touch healthier than their counterpart. 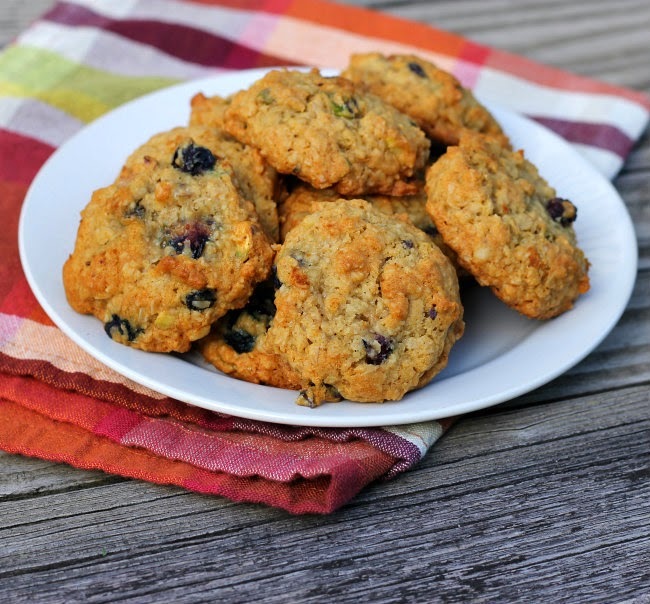 So since I made these a touch healthier I am going to call these babies blueberry oat breakfast cookies. I love how these turned out, they are super moist and perfect for a breakfast on the go. 3. Add the egg to the butter mixture and mix until blended in. 4. Combine the flour, oats, salt, and baking soda and add to the butter and honey mixture, mix until well blended. 5. Gently fold in the blueberries and nuts. 6. Drop by teaspoons onto a lightly greased cookie sheet. Bake for 10 to 12 minutes or until cookies are golden brown. 7. Cool completely on cooling rack before placing them into an airtight storage container. I love that I can now eat cookies for breakfast! I hope I can eat the dough, too…these look wonderful! Well, I think breakfast cookies is a wonderful concept! 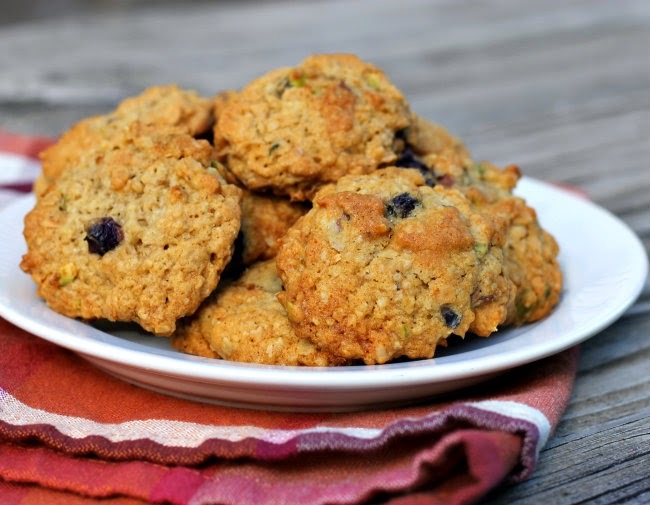 Like you said, sometimes, you’re just on the go and need a quick snack and here you go, the kids will love these and they are a touch healthier than regular cookies. Sometimes, I find I just need a little snack for the kids when I put them in their carseats and we have to go somewhere in a hurry =) And I love berries too in summer! We have a wonderful blueberry patch near us and we pay 2 bucks a pound, we pick a ton and freeze a ton for winter baking and snacking. Blueberries are my favorite too in desserts =) Can’t wait to try. Starting off my day with a cookie always sounds like a good idea. Bonus that these are healthy! !